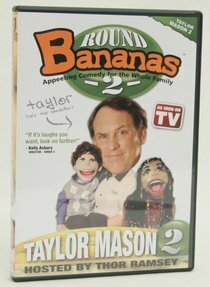 Taylor Mason returns to the hit TV show BANANAS for round 2! So if your ready for a few good belly laughs or a little comic relief, look no further! See the side-splitting return of Taylor and his "sidekick" Romeo as they go "shopping for dummies." Plus, you'll crack up when the puppets take the words right out of Taylor's mouth. BANANAS is more than just stand-up comedy. It has outrageous audience participation moments and a hilarious interview with Taylor's under-used puppet Juliet. This show will prove that when it comes to comedy, Taylor is no dummy. Best of all, it's good clean fun for the entire family! About "Bananas Featuring Taylor Mason 2"